Bosses at a strike-hit bus firm today threatened to reduce its offer to drivers if the industrial action continues. 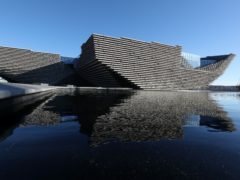 First Aberdeen managing director Andrew Jarvis said the company was at its “breaking point” and cannot offer any more due to the losses incurred by the strike action. It comes after talks to hammer out a deal to end the strike broke down and Unite the Union said the drivers had officially backed “all-out indefinite” industrial action from next Friday. It is understood one of the sticking points in the negotiations is the hourly rate of pay for new drivers – with 12 months service or less at the company – which First had initially proposed at £9.50 in February. During negotiations the bus firm upped its offer to £10 per hour in the first year, but only for current employees. New hires would receive £9.80. Officials from Unite are standing firm with their demand that all new drivers, current or not, are paid £10 per hour. Unite branch convener Graham Gavin said the revised offers “haven’t gone far enough”. The union and First Aberdeen remain at loggerheads. First Aberdeen had initially proposed that drivers with four or more years of experience would be paid £10.85 an hour. During negotiations with Unite that has now risen to £11.40. Mr Jarvis believes the losses to the firm are between £100,000 and £200,000 in the 10 days of industrial action so far – and warned that could mean the striking drivers get offered a worse deal than the one that’s currently on the table. He said: “We might be going back the other way, reducing rates compared with where our last proposal was. “People have got to be realistic, we’ve stuck our neck out and got to £11.40, which is a reasonable hourly wage. Mr Gavin hit back at the company after being informed that it might cut the deal to drivers. He said: “First have already made vastly reduced proposals to our driving staff. First’s latest proposal to end the strike was rejected by members of the union at a mass meeting on Thursday night. Mr Gavin also disputed claims by First that less than a third of all striking drivers were at Thursday’s meeting – he said that there were “easily” 200 out of the approximately 350 striking drivers in attendance. First has drafted in 45 employees from across the country to drive buses during the strike. Each one has to be housed, paid their original salary and receives a £25 allowance each day for food. First Aberdeen has now brought in independent mediating service ACAS in an effort to bring the industrial action to a close. Striking drivers and their families and friends outside First Aberdeen HQ. Union officials say they offered to go to ACAS at the beginning of the process, but the offer was “rejected out of hand” by First. Mr Jarvis said the idea was never formally introduced, but it had been discussed in previous meetings. He said: “ACAS are really good when two sides have fallen out, and have difficulty being in the same room as each other. “That’s not been the case at all during our negotiations, there’s been nobody thumping the table or shouting, so there’s been no formal request for ACAS. “We talked about it around the table and we all agreed that we didn’t need them. He did however say that the issue was not properly discussed at the time. If no deal is reached by tonight, some drivers with less than five years service will have their contracts terminated, following an enforced five-week notice period and be offered the new contracts in return. Many drivers have already signed up to the new contract, and have submitted it with a letter from their solicitors, with the intention of continuing their strike action.